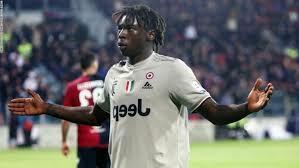 Juventus’ recent 2-0 win at Cagliari was marked by constant monkey chants being directed at Moise Kean and two other teammates. Kean’s response after coming off the bench to score Juve’s second goal was to stand in front of the home fans, arms outstretched, in response to the chants. He later took to Instagram to say his actions were “the best way to respond to racism”. Afterwards veteran team-mate Leonardo Bonucci said, in a television interview, that Kean, born in Italy to Ivorian parents, “could have done it [celebrated] differently” so “the blame is 50-50″. But of far more concern were the words of Juve manager Massimiliano Allegri who felt that his teenage striker should not have responded to the racist chants.